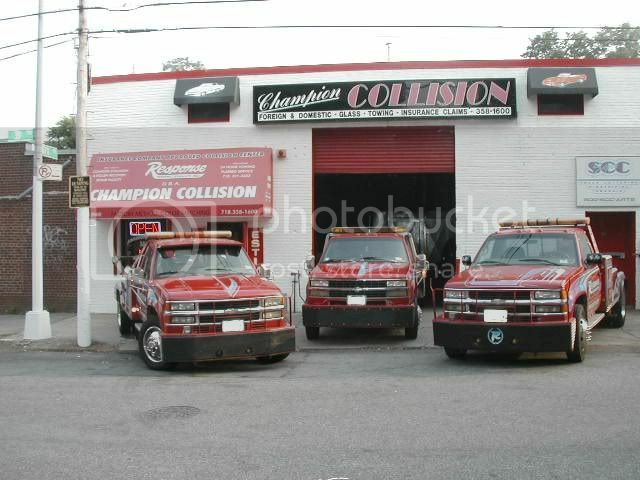 Flushing, NY Auto Body Repairs and Towing Services Champion Collision Center / Response Towing Service Inc. Champion Collision / Response Towing Service Inc. has been serving customers in the greater New York area since 1984 by providing responsive towing services, high quality auto body repairs, and personalized customer service. Whether you need road service, towing, or help talking to your insurance company, we are the business for you. With our 24 hour service, we will always be available to accommodate any need that you may have. We stand behind our work with a lifetime warranty on all collision repairs. As a Insurance Company Approved Collision Center we specialize in all insurance claim work - from start to finish. Call us first – we’ll help you with all insurance claims. We can settle Insurance claims with all insurance companies. Full auto, truck, and motorcycle painting service, including expert color matching and computerized paint mixing system. Factory method color matching and oven bake spray booth. Our friendly and professional staff is here to answer any questions you may have about our company or our services. We provide superior service and will return your vehicle to pre-accident condition. After an accident you have enough to worry about. We can take the hassle out of calling your insurance and can take care of it for you. Rental cars are available. Contact Champion Collision / Response Towing Service today at 718-321-3333 to schedule your free estimate for auto body repair services or for towing services. Browse our website for more information about our Response Towing services.